(Bloomberg) -- Earnings season might be the star of the show, but investors are increasingly worried about the supporting cast. Here are just some of the risks that threaten to mar Corporate America’s upbeat reports: An escalating trade clash that spurs runaway inflation and imperils market access between the world’s two largest economies. A Federal Reserve hellbent on hiking -- upending the business cycle in its wake. Even worse, economic overheating that sparks declines across financial assets. And don’t forget rising concern about a disorderly shift in China’s growth model, with echoes of the 2015 global sell-off. “There are a lot of different themes competing for our attention,” according to Peter Tchir, head of macro strategy at Academy Securities. “From solid U.S. growth, to Europe getting its act together, to Chinese and U.S. currency moves, to the implications of trade wars with China and with the rest of the world, to the Fed,” he wrote. Amid escalating trade tensions, the S&P 500 Index has still managed to advance nearly 7 percent off its year-to-date lows as earnings estimates drift higher and wage inflation remains subdued, notes Jonathan Golub, chief U.S. equity strategist at Credit Suisse. “While we experienced a global synchronized recovery during 2016-17, 2018 is all about divergence, with U.S. economics, earnings and stock prices continuing their upward trajectory while the rest of the world has rolled over,” he wrote, calling for the U.S. equity benchmark to end the year at 3,000. The decoupling of the U.S. from the rest of the world is expected to continue. Year-ahead earnings growth by American companies is forecast to run nearly twice as hot as in other developed markets -- so long as border thickening doesn’t crimp earnings prospects. Citigroup contends that trade issues may fade to the backburner, pointing to signs the market had already priced in the effects of the dispute to date. However, Morgan Stanley’s chief U.S. equity strategist Michael Wilson sees Corporate America, rather than President Donald Trump, elevating the trade issue, which could prompt investors to revisit their expectations for earnings growth. “The second-quarter earnings season will bring an inevitable acknowledgment from companies that trade tensions increase the risk to forward earnings estimates, even if managements don’t formally lower the bar,” he wrote. Wilson downgraded small caps to equal weight and tech to underweight in a note Sunday, cautioning about the probability that these recent outperformers will “get wet.” He expects the S&P 500 to end the year at 2,750, below current levels. Friday -- in which Jobs Day doubled as Tariff Day -- offered backing for those betting U.S. economic strength will buoy domestic assets through any global tiffs over trade. As well, the data imply that the world’s largest economy isn’t overheating in a fashion that would trigger aggressive rate hikes by the Fed that expedite yield curve inversion and an ensuing recession. This strength in equities carried through to Monday with the S&P 500 up 0.9 percent, but strategists are divided on how long this backdrop can endure. Dennis Debusschere, head of portfolio strategy at Evercore ISI, called the “Goldilocks” jobs data supportive of a slower pace of Fed tightening that would help global equities, and particularly battered financial stocks, regain their footing. “Investors are discounting limited rate hikes and a calming of trade tensions, under the assumption that the Fed/Trump/China can’t risk a recession now,” he wrote. “The ‘Goldilocks’ quality of the US labor data has continued to underpin risk sentiment,” agreed Rabobank strategists led by Richard McGuire. 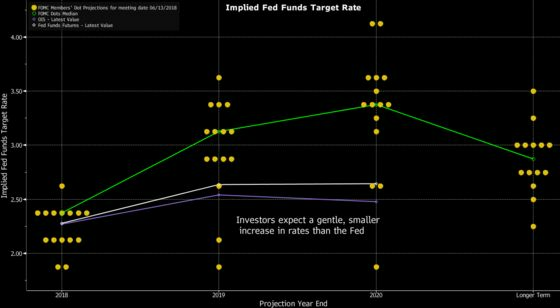 Tepid price growth in concert with the brewing trade war has given bulls ammunition that the Fed will be ever-gradualist if its tightening trajectory imperils risk appetite, the bank said. Like his peers, Societe Generale global fixed income strategist Kit Juckes credits the return of the risk appetite to the "insouciant" response from Treasuries to June’s non-farm payrolls report. However, he expects this will prove fleeting. And even if yields don’t rise materially from current levels, the scope for low risk-free rates to further support equity valuations appears limited. The elephant in the room for investors trying to gauge the health of the global economy is whether the recent weakness in Chinese financial assets reflects or exaggerates the magnitude of the slowdown in domestic activity before tariffs ever came into effect. Chinese stocks slumped into bear market while the U.S. dollar appreciated by more than 6 percent relative to the yuan, factors which may cause authorities to shy away from their deleveraging campaign. 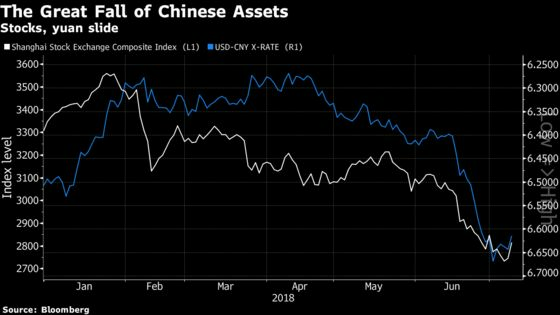 After the currency in June suffered its biggest monthly drop against the greenback since 1994, Chinese policymakers helped firm up risk sentiment globally by reassuring markets that the yuan hasn’t been weaponized as part of a trade war. Beijing’s focus on propping up the currency is a positive, argues Mark Williams, chief Asia economist at Capital Economics. “This distinction -- continued efforts to control at least the pace of the renminbi’s decline alongside a more hands-off approach to equities -- suggests that some lessons have been learned from the 2015/16 debacle: primarily that equity market falls don’t matter much to China’s economy, whereas large-scale currency moves do,” he wrote. While stability in the currency may be a boon for global financial stability, this offers no respite for Chinese exporters. Ahead of the imposition of tariffs, the new export orders subindex of the Caixin manufacturing purchasing managers’ index has lingered in contractionary territory for three consecutive readings. Meanwhile, concern about the extent of ebbing Chinese imports continues to have negative ramifications across commodity markets. Copper last week marked the biggest weekly slump since 2015 while the LMEX Index of six industrial metals on Friday closed at the lowest level since August. Waning Chinese demand and pressure on the yuan -- which makes dollar-priced commodities more expensive for the country’s manufacturers -- is placing pressure on the industrial cycle. 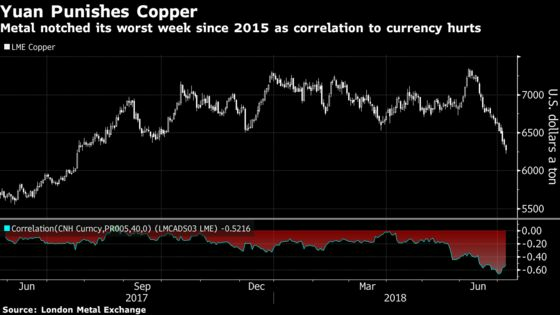 It’s adding up to a double whammy, underscored by the elevated correlation between copper and China’s currency. The rout in industrial metals -- an early stage input in the supply chain -- underscores a sea-change for global markets from an investment-led growth model to one of consumption, according to Morgan Stanley. The result: inflationary pressures around the world and lower commodity prices. “Falling raw material prices may tell us more about a shift within global terms of trade than easing inflationary pressures,” strategists Hans Redeker and Gek Teng Khoo wrote in a note. The travails of firms in the world’s second-largest economy and their manifold potential worldwide ripple effects are starting to creep onto center stage. 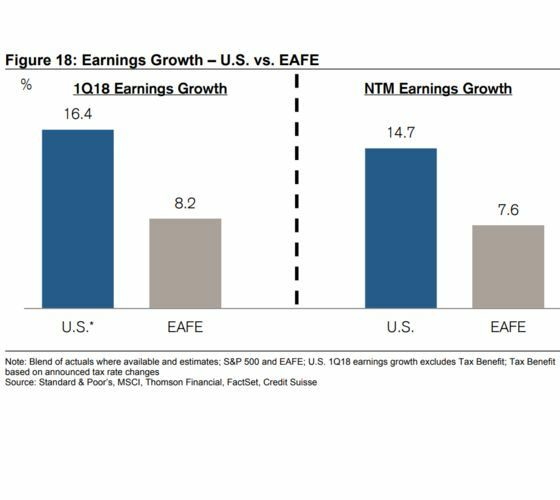 Even with continued double-digit profit growth by companies in the world’s largest economy a foregone conclusion, earnings season might end up playing second fiddle.